Twenty-year SPS veteran Valerie Chamberlain, Manager of our Business Management Department, has been volunteering with a unique non-profit kid’s organization, the Jr. Posse Youth Equestrian Program, otherwise known as the Compton Jr. Posse. For the past four years Valerie has worked closely with Executive Director, Mayisha Akbar, in a number of capacities – anything from being part of their fundraising committee, to preparing and writings grants, and even helping to consistently grow their donor base. The Compton Jr. Posse (CJP) is an organization with the motto, “Keeping Kids on Horses and Off the Streets.” Since 1988, CJP has been connecting with inner-city youth by using horses as a motivational tool. This organization provides an after-school alternative to the drug and gang lifestyle by offering different options for the children – Riding, Ranching, Education, and Outreach. To ride the horses, the kids have to keep their grades up in school. 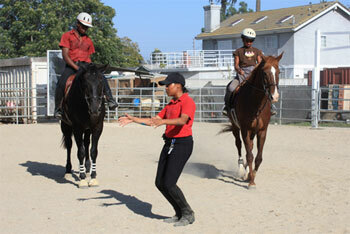 Through these educational and equestrian activities, youth develop responsibility, discipline and self-esteem. Students learn to set and achieve both academic and career goals. In 2010, they launched a Mounted Jr. Ranger program in conjunction with the Mountains Recreation and Conservation Authority in the Santa Monica Mountains. They attend competitions, have traveled to foreign lands, and have the support of 2008 Olympic Gold Medalist Will Simpson, and Olympic Bronze Medalist Charlotte Bredahl-Baker. If you would like to know more about this organization, or help out, please visit: www.comptonjrposse.org, or email Valerie at vchamberlain@spscpa.com.